This article contains the stats, strategy, and guide for Caster - Hans Christian Andersen. We will update this as soon as the game comes out. 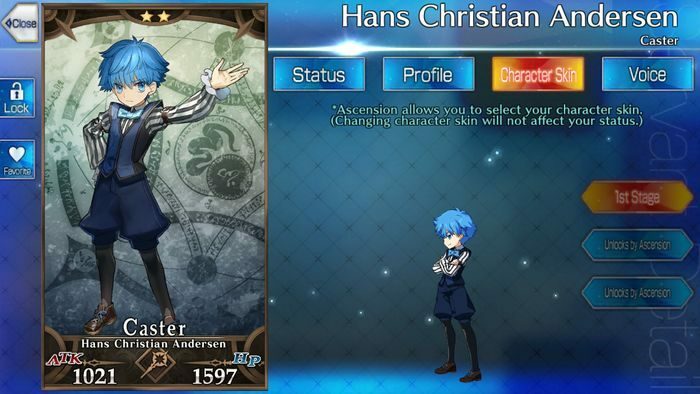 This article contains the skills, stats, strategy, and ability of Hans Christian Andersen of the Caster class from Fate Grand Order [FGO]. A 2 star Rarity Caster servant that can be summoned using Friend Points. Hans Christian Andersen has High-Speed Incantation which refills his NP gauge by half, which allows him to unleash his NP early. Two of his active skills both encourage C. Stars, this makes him a versatile support buffer. Aim to maximize his Innocent Monster then follow up with Human Observation. To make the most out of his buffs, pair him alongside other servants that have high Arts Cards. It will be advantageous to chain with the party rather than opting for a Brave Chain to compensate for his lackluster offense. His Noble Phantasm boasts a guaranteed HP recovery for 3 turns, however be sure to reinforce it to increase the chance of gaining the buffs from a staggering 60% to a respectable 80%. Jeanne d’Arc seems redundant to pair with Andersen at first given their similar NP, however she can prevent him from fainting with Luminosite Eternalle. She further improves on C. Star gains with Revelation, thus consider the last ally to be an offensive servant that capitalizes on the accumulated C. Stars. Divine Banquet facilitates Andersen’s NP generation by 25%, which cuts to perform his Märchen Meines Lebens. Having NP on hand will ultimately provide the needed buff to pierce through the enemies’ defense. If you do not have this 4 Star Craft Essence, Sorcery Ore is a decent alternative. Human Observation A 3 7 Increases party’s critical damage for 3 turns. High-Speed Incantation E – 8 Charges own NP gauge. Innocent Monster D 3 7 Gain critical stars each turn for 3 turns. Reduces own defense by 14% for 3 turns. Chance to apply each of the 2 buffs below. Increase all allies’ attack and defense buff for 3 turns. Regenerates party’s HP for 3 tuns. His works have now been adapted into several movies, tv shows, and musicals, making him one of the most popular children’s book writers alongside the Brothers Grimm and Mark Twain.